Ghosting across the line in the inky blackness of a Mediterranean spring night, finally slicing through the finish line set on the very waters where some 40 odd years ago he cut his teeth as a young, aspiring sailor harbouring great dreams, at 01:47:00 local time Guillermo Altadill and his talented, ever reliable Chilean co-skipper Jose Muñoz secured second placed in this third edition of the Barcelona World Race, the round the world race for two crew which left the Catalan capital on 31 December 2014. After pressing the eventual race winners hard until New Zealand, where Altadill and Muñoz had to take the tough decision to make a 24 hours pit-stop to repair their engine generator, they finish 5d 5h 56 min 36 secs behind Cheminées Poujoulat's Bernard Stamm and Jean Le Cam. The winners crossed the line on Wednsday 25 March at 1750 UTC, completing the course in 84d 05h 50m 25s. 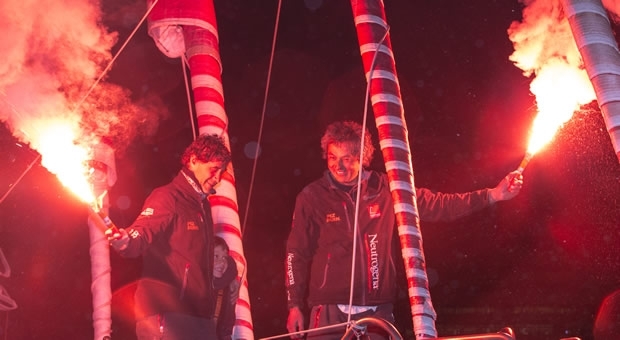 The Spanish-Chilean partnership, which was only competing in their second major IMOCA race as a duo, finished the theroretical 23,321 miles course in 89 days 11hrs 47mins at an average of 10.86 knots. By making their technical stop into Bluff, South Island New Zealand, the duo are reckoned to have lost 930 miles, or close to the 90 hours which was Altadill's prediction as they as they diverted on 11 February. Afterwards, until their return to the North Atlantic, they maintained a very similar margin behind Cheminées Poujoulat. But despite their losses Altadill still paid a rich tribute to the winners, saying 'they sailed an awesome race, did not mak e mistakes and probably would have won anyway even if we had not had to stop." Their actual distance sailed is 27,788.34 miles at a computed average of 12.94 knots. By comparison Cheminées Poujoulat sailed 27,953.43 miles at an average of 13.8 knots. Chilean José Muñoz, 42, is one of South America's best known ocean racers, and in finishing second today has made a very successful step up from the Class 40 he raced in the Portimao Global Ocean Race. With his close friend, mentor and co-skipper on Felippe Cubillos on Desafío Cabo de Hornos, he took second place in the 2008-9 doublehanded race, with stops, around the world. Off Cape Horn on 28 February past, Muñoz paid a very warm tribute to the inspirational Cubillos who died in a plane crash in 2010. For Altadill, this is one of the high points of his career, finishing runner up in the doublehanded round the world race which was originally conceived to promote his home city. He was one of the pioneering skippers to take the start line in the inaugural edition in 2008-9 but rudder problems meant he and American double Olympic medal winning co-skipper Jonathan McKee were the first duo to have to retire from the race, before they had even reached the Indian Ocean. Success today completes a measure of unfinished business for Altadill. They raced the final 26 days of the course with almost no communication tools after losing their antennae as a result of a crash gybe. Second place maintains the very successful record for the IMOCA 60 which was designed by Farr Yacht Design, and built in Cowes, England by Offshore Challenges Sailing Team originally as the Estrella Damm for Altadill and McKee. It led the 2008-9 Vendée Globe in the hands of French skipper Sébastien Josse as BT before he had to retire into New Zealand. In 2010 Roland Jourdain sailed this boat to win the Route du Rhum against many newer generation boats. Altadill's passion for the boat helped him to influence British skipper Alex Thomson into buying it for the 2011-12 Vendée Globe. As a precursor to this, he helped develop and optimise the boat which he and Thomson then sailed to second in the Transat Jacques Vabre two handed race to Costa Rica. And with the same boat, Thomson then broke his Vendée Globe hodoo to finish third in 2012-13. Although the combination of Altadill's rich and varied experience, Munoz's vigour and reliability matched to the well proven, highly optimised IMOCA 60 clearly marked them out as one of the pre-race favourites, Altadill always refused to acknowledge this, saying that 'it is down to the ocean to decide'. But since the very first hours of the race, Neutrogena have been among the vanguard of four, pressing hard early leaders Alex Thomson and Pepe Ribes on the newer, theoretically faster Hugo Boss before a dismasting. Altadill and Muñoz proved well able to not just match the pace of the leaders, but frequently exceed it. They lead the race four times, most recently on 17th January and after an initial tactical loss on the entrance into the Indian Ocean, they certainly matched Cheminées Poujoulat's speed. Had they not had to stop in to New Zealand, perhaps the final outcome of the race might have been different! "We are happy, happy to finish the race, and happy to finish in second place," said Altadill. "That is more or less what we had as a goal, to among the three first places and so we have achieved that goal. "Of course the pitstop hurt us, we started very well and were pretty close to Cheminées Poujoulat and then we had to leave them on their own. We have made a very good race even though we had to sail 1000 miles more than the rest of the fleet. But thank god we had a very good skipper on the boat, so we could sail at 100% again. "The two first editions I could not finish and so this third edition I am happy to have been able to finish, and in second makes me happy." Guillermo Altadill: " The start, Cape Horn and the moment we had to stop in New Zealand were the good and the bad moments." José Munoz: "The start and then during the race you are really not thinking about anything else but competing except the stop. That was never in the plan. But Cape Horn, passing close to home, was mythical, unfortunately we passed at night, but Cape Horn was special, exciting and rewarding." Altadill: "Jose has an incredible patience. The most difficult part of the race was probably putting up with me and not the sailing. It has been perfect. We trained together before and knew each other. Each of us have our characters and on every boat, and there is something in sharing the goal together to finish the race. Most of the time you are just sailing and talking about the navigation and the sailing, but there are a few lighter moments, but we were very focused because there was always someone around - first Cheminées Poujoulat and then GAES Centros Auditivos. So we were very concentrated all the time. Living together was perfect. Of course in three months every one has good and bad moments, moments when one is not in a good mood but it passes. He is very patient, he is a very good sailor and we have complemented each other." Munoz: " It feels like I slept the whole race, because it is all a blur, I can't remember much about it. The truth is we divided the jobs very evenly. Guillermo kept the boat moving at 100% and he has his character and me mine, but in the end we focused on doing everything very professionally and very well. It went very well." Guillermo Altadill: "I always said I wanted to finish this race with no stops, but to finish this race in second place is really good." Munoz: " It has been a wonderful race for a Chilean guy sailing in this kind of race, getting to know this kind of round the world race and sharing it with Guillermo who is an extraordinary sailor. It was a new experience every single day. Guillermo Altadill: Since the sixth of March we have had no communications at all, no weather information at all. In one gybe the mainsail took off all the antennae of the GPS, the satellite, everything. The Iridium antenna was gone and so we had no weather information, no communications. We talked with our team once a day with the emergency iridium just to say we were OK. We did not know where the other boats were, what weather we would get. We were in touch with the race organisation and so they gave us a really short weather briefing, but we had no weather information, no routings, nothing. We were sailing like the old times. And in truth if I sail around the world again I would do it like this. We have been sailing better with no information than with information. Guillermo Altadill: "The day we decided we could not sail the Pacific with no chance to charge the batteries, no watermaker, nothing, so we made that decision. We knew that it was not just what you lose on the course, you also lose the chance to be on the same weather system. Two hundred miles is really nothing but after that it was too much. But Bernard Stamm and Jean Le Cam were sailing really well. Probably they would have won even if we did not have to stop. But we knew it was almost impossible to regain the miles. We knew it was a hard decision, but in this kind of race you have to sail well, you have to make the right decisions, and you have to keep the material in one piece, and know how to fix it. That is part of the game. It is not just saying 'well that was bad luck' It is part of the game, part of the sport. There are no excuses for that kind of failure. Jean and Bernard sailed with no errors. They deserved to win. We made some errors as well. But there were some mistakes, including the one that required us to to stop, so we are happy, we finished second. After three months what did you miss? José Munoz: There are a lot of things I cannot say! I want to see my family. I did not have any communications with them, we just connected for a couple of minutes every seven or eight days. I would like to have to a nice shower and then a good bed. And then I suppose I will wake up with Guillermo telling me we have to gybe! It will not be easy getting used to reality again. And he is such a nice skipper. I don't know if I would sail around the world with Guillermo again, but I would definitely sail with him again. The exclusion zone was really good. There was some ice close to us but we did not see any. Guillermo Altadill: "I did not know that. I had no information about the boats in this race or that race. But when I heard he had been called up to sail in the Volvo I was very proud, and knowing he has crossed Cape Horn just 15 or 20 days after me, that is curious, and nice! "The velocity of these boats is incredible, sailing at 23-25 kts for two or three minutes at a time is very special. "It was a very special moment to finish this race here. I was born in this city, I learned to sail in this city on this harbour, and it is a great moment to finish a round the world race here. It was an awesome moment, one of the best of my sailing career, finishing this race."